CONTENTS: M. Toomsalu. Do anthropological, anatomical and pathoanatomical exhibits speak? R. Allmäe, J. Limbo-Simovart, L. Heapost, E. Verš. The content of chemical elements in archaeological human bones as a source of nutrition research. P. Hussar, I. Benno, Ü. Hussar. Glucose transporters in the blood-brain barrier. A. Gerina-Berzina, U. Vikmanis, U. Teibe, S. Umbrashko. Anthropometric measurements of the body composition of cancer patients determine the precise role of the body surface area and the calculation of the dose of chemotherapy. A. Gocentas, A. Landõr. Stress and muscle damage monitoring in high-level basketball players. T. Kallavus, V. Reimaa. Theoretical and practical issues in the implementation of case-based networking in the field of special educational needs. B. Karmakar, E. Kobyliansky. Finger and palmar dermatoglyphics in Muzeina Bedouin from South Sinai: A quantitative study. J. Kasmel, T. Kasmel. On Prof. Daniel Georg Balk (1764–1826), supervisor of Karl Ernst Von Baer’s doctoral thesis On Estonians’ Endemic Diseases. D. Kažoka, J. Vētra. Comparative analysis of the central body fat distribution of women in the urban population in Latvia. O. Kolesova, J. Vētra. Female pelvis types and age differences in their distribution. C. Krick, C. Raschka. Sports anthropological comparison between male martial arts fighters and the students majoring in physical education. J. Laudanska-Krzeminska. Dietary behaviour of students from Poznan universities. I. Legusa, V. Groma. Matrix metalloproteinase 9 (MMP-9) is differently expressed in cutaneous lichen planus and lichen sclerosus. R.-H. Mikelsaar. 220 years from the birth of the medical and natural scientist Karl Ernst von Baer. H. Orro, K. Kokk. Erectile dysfunction etiology and hormonal changes. J. Peterson, H. Kaarma, S. Koskel. An anthropometric model for nutrition research of Estonian female students. L. Pļaviņa. Comparative analysis of students’ physical activity levels. N. N. Pomazanov. 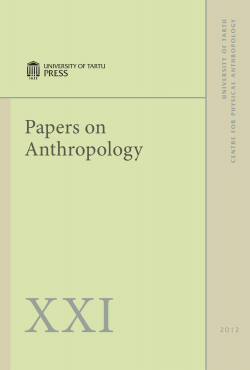 Morphotypological cranium variability in the population of central Belarus in the 2nd – early 3rd millennium A.D. K. Põlluveer, R. Stamm, M. Stamm. Anthropometric and psychophysiological characteristics of top female volleyballers in relation to the players' position on the court. C. Raschka, D. Bambusek, J. Türk. Anthropometrical and sport constitutional comparison between young firefighters (≤ 30 years) and sport students (≤ 30 years). C. Raschka, P. Kothe. Sports anthropological comparison of physically exercising patients with Diabetes Type I and Diabetes Type II. L. Smane, M. Pilmane, I. Akota. Local expression of inflammatory cytokines in the facial tissue of children with a cleft lip and palate. I. I. Tokin, I. B. Tokin, G. Filimonova, P. Hussar. Dynamics of cell population structure in liver biopsy of the patients with chronic hepatitis viral infection. T. Viik, S. Kana. The activities of the Estonian Naturalists' Society in 2011. O. D. Volchek. Functional brain asymmetry and the proper name.